Good morning and happy Monday. PaperArtsy currently have a watercolour challenge, and as I've recently got some new stamps I thought it would be rude not to join in! This is made with a PaperArtsy stencilled background and 3 shades of Distress Ink. My beautiful woman is from the PA Tracy Scott 17 plate. I don't know if you can buy this directly from PaperArtsy yet but you can certainly get it from Country View Crafts. I really enjoyed making this, it was nice to just go with the flow. I'm also entering this into the Happy Little Stampers watercolour challenge. 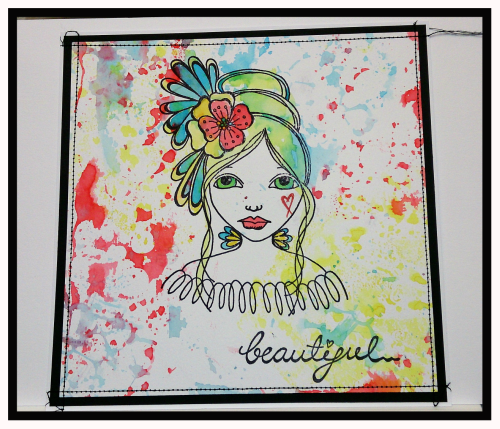 Love the effects you have created with the Distress Inks Sue. I love the soft and pretty colours on your very arty card Sue. Gorgeous. Hi Sue, I love this image! She has a real hippy look which I looove. Lovely background Sue, great image too! Such a lovely bright watercolour look on the background of this piece. It sets of the cheerful face so well. Very nice.